Handel’s Berenice was written at a time when the composer desperately needed a success. By 1737 he had been competing for audiences with the rival Opera of the Nobility for four years, but unfortunately things did not play out as he had hoped. Pressures, including the work involved to complete the piece, led him to have a stroke, and the opera, conducted by John Christopher Smith as the composer’s right hand was temporarily paralysed, lasted a mere four performances. 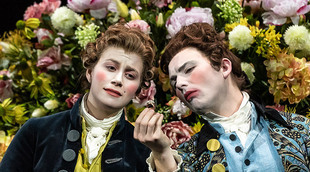 Although it was revived in Germany in 1743, and has enjoyed a little interest since the 1960s as Handel’s operas have come back into fashion, it did not, it seems, receive another performance in London until 2016 when La Nuova Musica contributed the opera to that year’s London Handel Festival. As such, the opening night of Adele Thomas’s new production, presented in the Royal Opera House’s newly refurbished Linbury Studio, possibly constituted only the sixth performance ever of the work in the capital. Set in Egypt in around 80 BC, Berenice tells the story of the eponymous Egyptian Queen. Prince Alessandro of Rome woos her but, despite such a marriage being politically expedient, she shuns his advances because she loves Prince Demetrio of Macedonia. The latter, however, desires Berenice’s sister Selene, and the situation is further complicated when Prince Arsace declares his love for Selene, and Berenice helps to further his cause. There is a happy ending, however, when Berenice sees that Alessandro seeks her purely out of love rather than for political expediency, and Arsace volunteers to step aside so that Selene and Demetrio can be happy together. The music is interesting both in its own right, and in the way in which it supports the dilemmas presented in the story. For example, when the Roman envoy Fabio sings of the bee who flies to pretty flowers to gain nectar rather than simply for their beauty (hence instructing Alessandro to see love simply as a means to an end), this insect is represented in the violins. Berenice’s ‘Chi t’intende?’, in which she dwells on the tribulations of love, is accompanied by solo oboe, while the opera ends with a minuet in D minor either denoting the sincerity of Alessandro’s love or conversely reminding us that the real life story, upon which the opera is based, will not end so happily. Thematically too, the piece feels extremely rich. Although the dilemma between private love and public responsibility is the basis of many an opera, the manner in which the issue is explored here is particularly effective. The fact that Fabio begins by instructing Alessandro to pursue ‘Love for gain, not for pleasure’ means there is a clear starting point from which we can then witness the narrative bringing us to entirely the opposite conclusion. Similarly, the thesis that if one remains true to love good political outcomes will follow represents a development in thinking on the vast majority of operas that present the same original dichotomy. Nevertheless, it is possible to see why Berenice was not more popular in the eighteenth century. Handel’s starting point was the libretto of Antonio Salvi’s Berenice, regina d’Egitto which had been set to music by Giocomo Antonio Perti in 1709. During the process of adaptation, however, recitatives were pruned and around ten arias cut. What remains feels very much like a series of episodes in which each character in turn indulges in their personal dilemma, following the latest plot twist. This, in crude terms, is actually the underlying formula to every Handel opera, but usually there seems to be a little more integrity in the way in which the whole is crafted. Here the piece may have felt overindulgent, and not conducive to a dramatic staging. Thomas’s ingenious ‘solution’ to the associated problems is to go with the grain of the work. In this way, every aria is made to feel like a showpiece as each is handed its own hook or style to consciously make it an exploration of the character’s feelings. For example, Arsace is handed foppish commedia dell’arte style gestures, and in ‘Amore contro amor’ goes about the stage knocking everyone, including instrumentalists, out of the way so that by the end virtually everyone has collapsed as a result of either the blow they have received or exasperation. Overall, the staging is lo-tech but extremely effective. It sets the drama in Handel’s own day with the costumes and etiquette displayed through the gestures being eighteenth century. However, the drama is not presented in a real space but rather on and around a long semi-circular green sofa with sphinxes (which allude both to the original setting and the type of ‘exotic’ object that might have been found in a pleasure garden) at each end. All of the characters are sitting on the sofa as the audience enters, and during the Overture they stand in a line bowing and curtseying as befits their character, status and relationship to the person next to them. Conversely, the start of Act III after the interval sees everyone back on the sofa, only now the pose of each represents where they have reached in the story. In this way, Demetrio is collapsed over it having been beaten, while others are sitting looking awkward and anxious. No character ever leaves the stage, and when they are not needed in a scene they sit or stand around the back of the sofa, never once breaking character as they maintain appropriate expressions throughout. 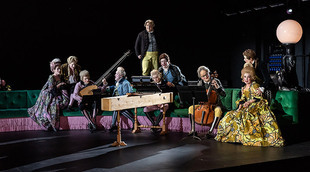 Three of the orchestra members, who play the archlute, harpsichord and cello, also sit on the sofa for the entire opera in full costume, and similarly maintain character with their glances and gestures. In fact, during ‘Chi t’intende?’ they walk around the back of the sofa for a tea break as they are not required for the aria. Even the exquisite costumes are clever as the colours in each allude to the character’s relationship with others. It is, however, less successful to include a momentary ‘Epilogue’ that provides a sting in the tail. 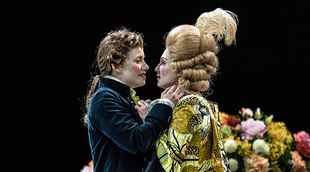 Originally, such a sting would have been felt throughout the opera as Handel’s audiences would have known how the story of Berenice and Alessandro ended, and so would have watched the entire opera feeling a slightly bad taste in the mouth. However, for anyone who does not feel this across the evening because they do not know the background, it does not work to serve up the poison in one huge dose at the end. The London Handel Orchestra, conducted by Laurence Cummings, is on excellent form, while the cast is also outstanding. From Claire Booth’s Berenice, whose soprano proves as sublime as it is assertive, to Rachael Lloyd’s Selene, whose mezzo-soprano is as sensitive as it is well shaped, and Jacquelyn Stucker’s Alessandro, whose soprano is possessed of a very sweet tone, there is not a weak link among them. The two countertenors, James Laing as Demetrio and Patrick Terry as Arsace, are also brilliant, with Laing revealing a particularly pleasing sound and Terry delivering a show-stealing performance by virtue of both his voice and command of the stage. There is also excellent support from Alessandro Fisher as Fabio and William Berger as Berenice’s adviser Aristobolo.